3" (7.62cm), 7 Leaf, Yellow. 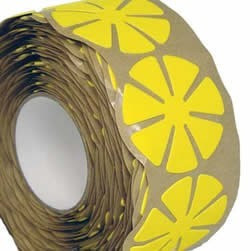 Used for polishing CR-39, Mid-Index and Hi-Index, 7-Petal vinyl backing, 3" (7.62cm) diameter. 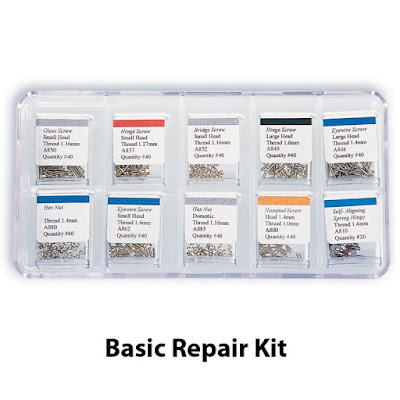 Combines durable flocked fibers with clear flocking cement. Resists breakdown and reduces slurry contamination. 250 pads/roll. Solid-Center blocks provide the extra support needed on AR coated lenses to prevent costly cracking and crazing. Available in 24mm and 18mm round, 17mm and 19mm half-eyes, and 17mm x 30mm oval. For optimal support, use the solid center blcoks with the OptiSafe Blocking Pads and OptiSafe Anti-Slip Pads. This combination will prevent cracking, lens slippage, and twisting. Supplied in bags of 50 pieces. T1125 - 25x40mm Provides excellect adhesion to oleophobic and super hydrophobic premium lens coatings. Apply pad to clean lens surface prior to applying blocking pad to prevent lens from "twisting" and "slipping" off-axis while edging. 500 discs/roll. T1647 - 35mm Blue disc to prevent lens surface from scratching during hand edging, grooving, faceting, drilling, polish edging, and also when handling/shipping of lenses. Apply to both sides of the lens. 2000 discs/roll. T3040 - 30x40mm Blue disc to pretect the lens surface from being scratched during finishing and deblocking. 1000 discs/roll. T1130 - Protects ultra slippery AR coatings from twisting off axis during the edging process. Provides excellect adhesion to ultra oleophobic and super hydrophobic premium lens coatings. Apply pad to clean lens surface prior to applying blocking pad. 500 discs/roll. T1100 - 30x40mm Provides excellect adhesion to oleophobic and super hydrophobic premium lens coatings. Apply pad to clean lens surface prior to applying blocking pad to prevent lens from "twisting" and "slipping" off-axis while edging. 500 discs/roll. TG899 - 22mm Blue disc to prevent lens surface from scraching during hand edging, grooving, faceting, drilling, polish edging, and also when handling/shipping lenses. Apply to both sides of the lens. 1000 discs/roll. TG900 - 22mm Blue disc to prevent lens surface from scraching during hand edging, grooving, faceting, drilling, polish edging, and also when handling/shipping lenses. Apply to both sides of the lens. 2000 discs/roll. TG844 - 22mm clear disc to prevent lens surface from scratching during hand edging, grooving, faceting, drilling, polishing edging, and also when handling/shipping of lenses. Apply to both sides of lens. 1000 discs/roll. The OptiSafe Color Matching Unit is designed to simulate daylight for the color matching of lenses. 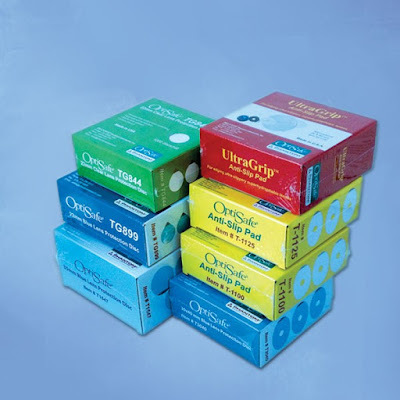 All types of lenses can easily be compared for coordination of desired colors. This productive, durable unit is very simple to use - just flip the power switch, place lenses on the illuminated surface and enjoy hours of simulated lighting conditions for color matching. The OptiSafe Color Matching Unit, item #E490 is packaged in a 20 x 8 x 6in. (50.8 x 20.32 x 15.24cm) craft box. Shipping weight: 7 lbs. (3.18kg). 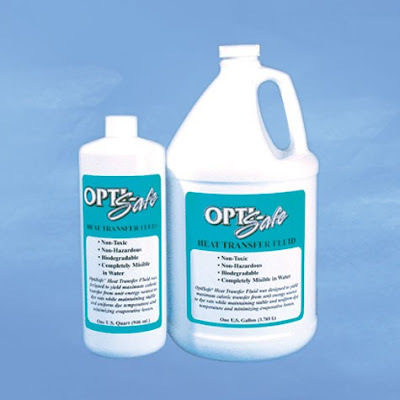 OptiSafe Heat Transfer Fluid - Four 15 fl.oz. State-of-the-art, microcomputer controlled, Automatic Lens Tinting Machine with dual digital time displays to show the tinting cycle set time, and also the remaining cycle time. Developed for both solid and gradient tinting with absolutely no lines. Free-standing machine, takes only a matter of seconds to set up, is easy to use, and features virtually silent operation. Versatile arm can rotate 360 degrees, and can accommodate up to four pairs of lenses at one time. 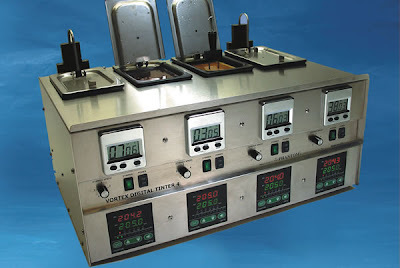 Machine features continuous agitation of the dye solution, offers a 30 Second to 60 minute timer with dual digital time displays, and an electronic beeper to indicate cycle completion. 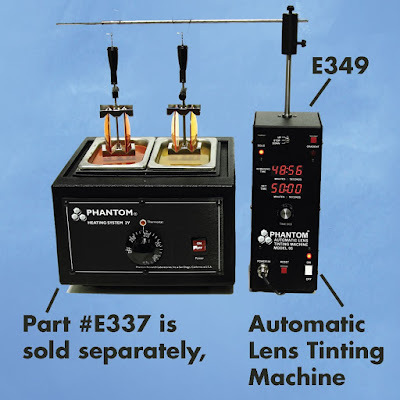 Package includes the Automatic Lens Tinting Machine, one lens holder (Model V1-RS), and a UL listed power adapter. An environmentally safe, water soluble, non-foaming lens grinding concentrate. 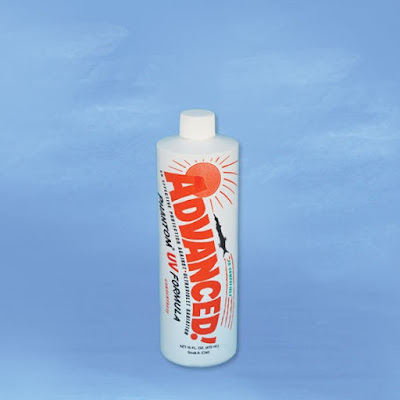 Specifically formulated to provide lubrication, cooling, and rust prevention when grinding glass, plastic, or photochromic lenses. Prolongs the life of the wheels and tools. 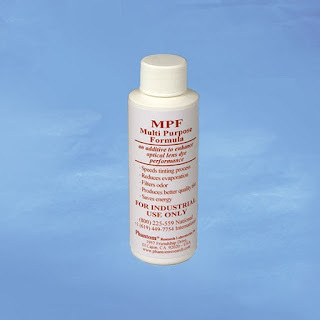 Multi Purpose Formula (MPF) is an optical lens dye additive that increases dye temperature, speeds the dyeing process, reduces evaporation, and absorbs odor. The percentage of increase in the temperature, vapor reduction, and odor absorption depends on the quality of the lens dye and the amount of MPF added. MPF also produces better quality tint and saves energy. 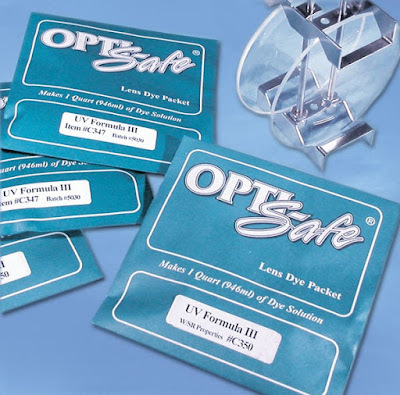 It works effectively with most conventional optical lens dyes. Color neutralizing formula, faster than conventional neutralizers, designed speficially for CR-39 lenses. Neutralizer 39X is used in full strength (not diluted with water), has a very low rate of evaporation, self-cleaning, and will not yellow lenses. Available in a Quart (32 fl.oz/946ml) and a Gallon (3.784 liters). 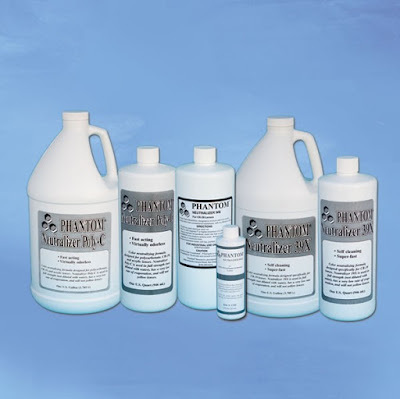 • Neutralizer Poly-CColor neutralizing formula designed specifically for poly-carbonate, CR-39 and acrylic lenses. Neutralizer Poly-C is used in full strength (not diluted with water), has a very low rate of evaporation, virtually odorless, and will not yellow lenses. Available in a Quart (32 fl.oz/946ml) and a Gallon (3.784 liters). • Neutralizer WB A water-based neutralizer designed to remove color from CR-39 plastic lenses with no offensive odor. Maximum temperature of 241 degrees F will not cause nearby dyes to boil over. Available in a Quart (32 fl.oz/946ml) and a Gallon (3.784 liters). • Neutralizer WB-II A concentrated Water Based Neutralizer designed to remove color from polycarbonate, high index, and plastic lenses safely and effectively. Available in an 8 fl.oz (236.5ml) concentrate bottle. Each 8 fl.oz. 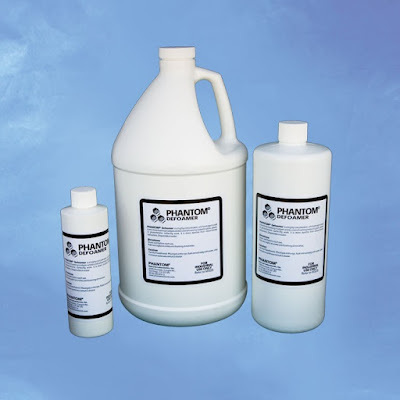 makes 1 Quart (32 oz./ 946ml) of neutralizer solution. OptiSafe® Heat Transfer Fluid (HTF) is the recommended medium when heating optical solutions, such as lens dyes, UV formulas, and neutralizers. HTF provides uniform heat throughout your dye heating system, ensuring a more stable and uniform temperature in each of your vats. 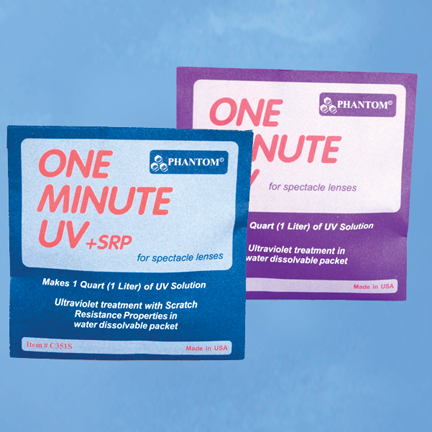 Even temperatures are critical when tinting and UV treating lenses. Loower temperatures can cause unstable dye shades and colors, as well as prolonged solution absorption times.